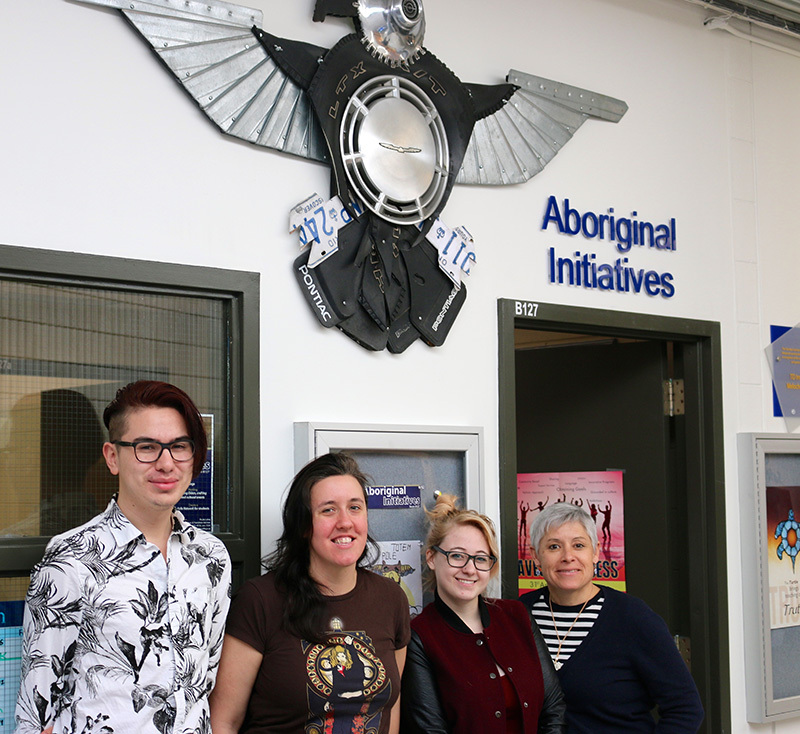 Elijah Williams, Kayla Parisien, Meagan Byrne and Paula Laing stand outside the Aboriginal Initiatives Office at Sheridan. Although Sheridan has an Aboriginal Initiatives office, much of the college’s community is unaware of its purpose. 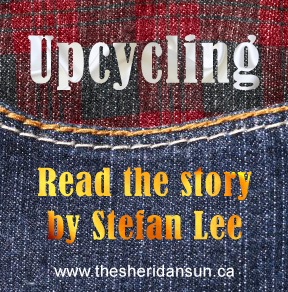 Sheridan’s Aboriginal Initiatives Office has been created mostly by mandate. Paula Laing heads the Aboriginal Initiatives Office, and helps Aboriginal students transition from their traditional backgrounds into the college’s community. “There are over 100 Aboriginal students at Sheridan right now, and that’s just the ones who have claimed descent,” said Laing. But there are more students than that, such as those who haven’t checked their Aboriginal status off on their papers, who don’t recognize their heritage as much as others. Laing insists that blood status doesn’t make a difference in her office, though. Everyone belongs. Elder Melody Johns, who visits the office every Thursday, explained that it’s not only students of Aboriginal descent who visit. The office welcomes all people, whether they’re simply passing by or they’re curious about the office and what it does. The Aboriginal Initiatives Office’s biggest job is to support students of all kinds; they want to provide academic, cultural and social support. The office has support lunches, providing free food available for anyone who visits. They provide tickets to various shows at Sheridan and try to provide a welcoming atmosphere to curious students who drop by. Smudging is a technique used by Aboriginal peoples, and many other religions, as a form of cleansing and healing for people, creating a positive atmosphere for those experiencing both its smoke and smell. Meagan Byrne, an Aboriginal student in the Game Design program, noted that many people have negative perspectives on the burning sage that wafts out of the office each day. Some people make faces as they walk by, asking what the awful smell is. Laing admits she has had students come in asking if she was smoking drugs in the office. Byrne added she has faced many students who are simply uninformed about Aboriginal culture at the school. Facing questions like “Oh, so you’re a Tomahawk?” and having to explain her culture has been challenging, especially when students admit they have no idea what they are talking about. This is something the office is working to change, though. While the office was meant to be slowly growing, it has changed exponentially. Over the past year, the office has been involved in several events, including a drum circle last month, and has spoken with different programs such as Media and Art Fundamentals to get them involved and aware. Laing is working with the office to create a Facebook group to make connections online, and aspires to involve Indigenous Studies at the college in whatever way she can. Added by Cait Carter on March 20, 2015.